India, with its vast resources of bamboo, has the potential to become a significant player in international bamboo export. That is the message from the Global Bamboo and Rattan Congress, which began on June 25, 2018. The meet has called for political leadership by producer countries which includes India, along with China and the Philippines. But even though India is the world's second-largest bamboo grower, its bamboo products capture just 4.5 per cent of the global market says the "State of India's Environment 2018 in Figures" (SoE in figures, 2018) published by Down To Earth magazine. This shows that there is a wide gap between demand and supply due to over exploitation, poor regeneration, low productivity and lack of market information. 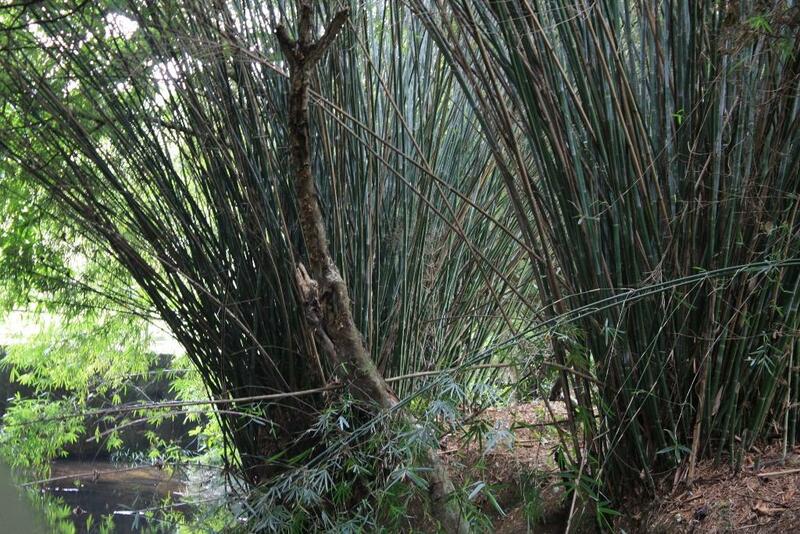 In November 2017, the government had recognised bamboo as a grass to encourage trade. 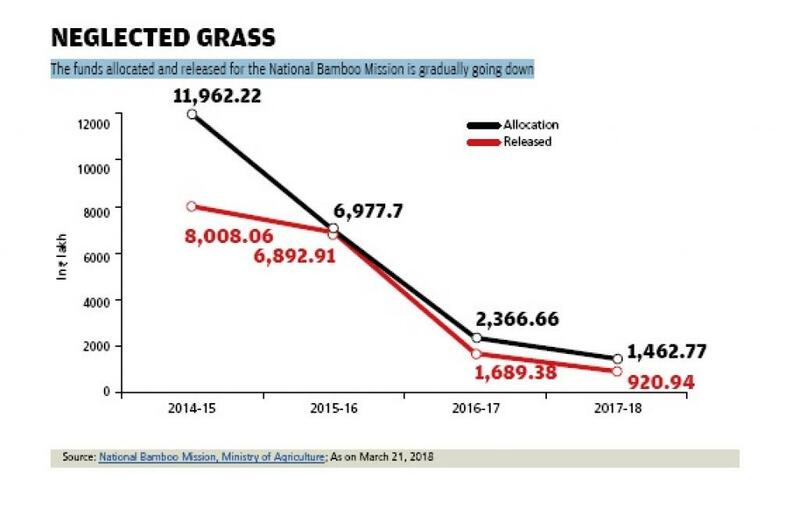 But the funds released under the National Bamboo Mission have consistently decreased since 2014. Besides, the allocated money too was not released and remains unspent. In 2016-17, close to 29 per cent of the money allocated to states under the mission remained unspent, while in 2017-18, around 37 per cent of the allocated money was not released to the states. The restructured mission, which was released after 14 years in April, 2018, under the National Mission for Sustainable Agriculture, aims at holistic development of this sector and establishing the linkage between bamboo growers and industries so that farmers' income gets a boost. An amount of Rs 1,290 crore is supposed to be spent under this mission during 2018-19 and 2019-20. While Saibal Dasgupta from the Union Ministry of Environment, Forest and Climate Change informed the Global Congress that bamboo grown outside forests is no longer considered as a tree by the Indian government—making it easier to use and cultivate without restrictions, two state governments deserve attention for undertaking an appreciable initiative this month. In fact, just two months after the start of the restructured National Bamboo Mission, Bihar and Telangana have shown a deep interest in promoting bamboo and have come forward to promote bamboo in a big way. The government of Bihar has decided to constitute a task force and formulate a bamboo policy for the state, informed Deputy Chief Minister Sushil Kumar Modi at a “bamboo conclave” organised at Patna on June 9, 2018. The event has been organised for the first time by the state environment and forest department. Soon after, on June 12, 2018, the Telangana government too amended the Tamil Nadu Forest Act, 1882, thus exempting bamboo grown in non-forest areas from the definition of “tree” to encourage farmers for taking up bamboo cultivation and increasing their incomes. Later this month, the government of Telangana has also decided to launch a massive bamboo plantations project on 506 hectares (1,250 acres) to provide a source of sustainable income to farmers. In fact, bamboo can generate 516.33 million man days of work every year reveals the Down To Earth annual book, based on the government’s Dalwai Committee Report on doubling farmers income that was released last year. But it seems the mission was not a priority in the recent past according to the government data accessed by this book. In 2017-18, 14 states and union territories had not received the allocations under the National Bamboo Mission. The restructured National Bamboo Mission, therefore, needs to learn from the past and ensure effective implementation of the scheme. Bamboo will then certainly be a game changer for the socio-economically backward areas and the farmers too.